The “trapezium” – the very bright inner stars of the brightest part of the nebula is a wonderful star nursery, where baby stars are springing to life. Unfortunately with such a wide field shot, these stars are not quite resolved individually although you can see a hint of them in the image. 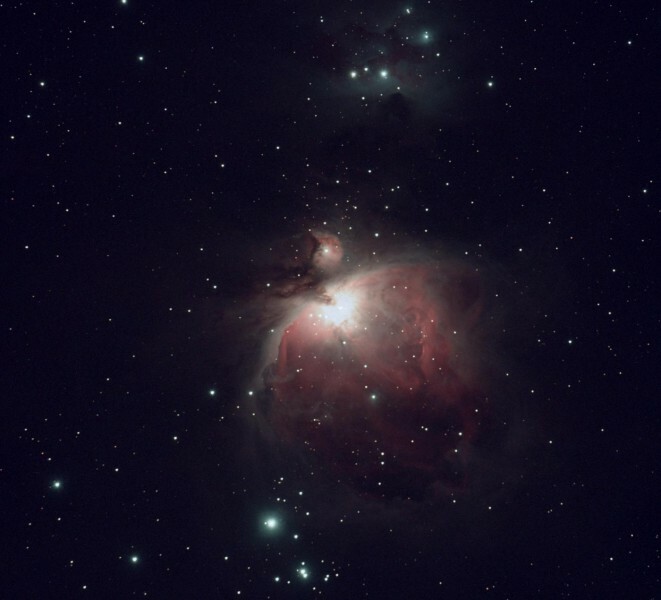 It’s interesting to compare this with an image I reprocessed of the Orion Nebula in May 2010. Those images were taken with a much larger scope – the CPC 1100, and with a Canon Rebel XSI. While this field is obviously larger, which do you like better? 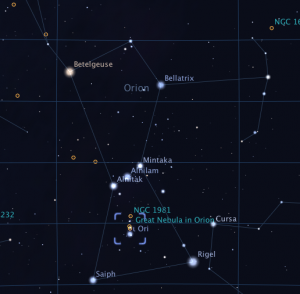 Locating the Orion Nebula is relatively easy. First, find the obvious pattern that makes Orion. Then drop into the middle of him – his belt – and right below that, you can see his sword. Therein lay this beautiful sight! This entry was posted by admin on October 12, 2010 at 8:54 pm, and is filed under Nebulas. Follow any responses to this post through RSS 2.0.You can skip to the end and leave a response. Pinging is currently not allowed.